Mountain Equipment Co-op (MEC) is a Canadian outlet for high quality, outdoor gear including products they market under their own label. (I believe Hilary's Mountain Equipment sleeping bag is a MEC product.) Last year they introduced a line of bicycles, which caused some consternation among local bike shops. As a cooperative MEC is subject to less tax than privately-owned businesses and will supposedly have a price advantage. Back to bikes. When my son-in-law Andrew was here I could see he was getting antsy, so I suggested a bike ride. Trouble was, he hadn't brought any gear. So off we went on a fast tour of Ottawa bike shops. Walking into MEC, I was struck by their display of bikes, and in particular their single speed bike. 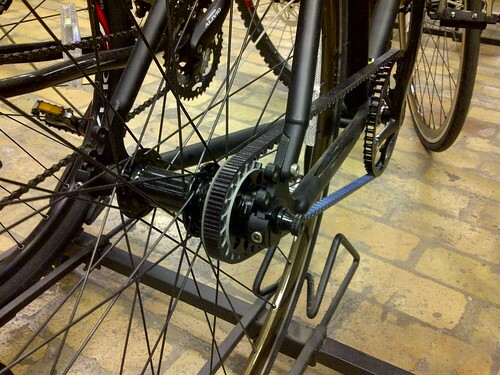 As you can see in the photo, they have used a belt drive system rather than a chain drive. The belt drive system is made by Gates. What are its advantages? I asked the MEC bike mechanic. Supposedly the belts are quieter and last longer than normal chains. On the other hand, you don't just buy the belt and install it – you need to replace the entire drive train; the bike frame requires a special break (secured by a bolt) to change belts; on a single speed a new belt is needed to alter the gear ratio (since links cannot be removed); there have been problems with drift – if the drive system is not in perfect alignment the belt can fall off (Gates has come up with some sort of guidance system to prevent this). The belt system is a bit of a novelty, I guess, but I don't think I'll be lining up for one in the near future. If it ain't broke, as they say, don't fix it. Posted by Kern on October 13th, 2011. Interesting – and a bit surprising – that a belt drive is found on a single-speed bike. From my limited reading on the subject of belt drives I assumed that part of their appeal was that the belt drive – coupled with hub gears – does away with the wear and tear associated with a traditional chain moving up and down the sprockets on the cassette, and the deformation which comes with chain deflection. I've noticed that chains on single-speed bikes, especially those found on BMX bikes – often make a feature of their chunkiness (because the chain isn't required to change gear it can be thicker and have less lateral movement). So they some times come in colour-coordinated options – presumably such variations in colour aren't possible, or economic, on the narrow chains that are required for derailleur systems. I was interested that James Bowthorpe chose a belt drive / Rohloff system for his circumnavigation trip. A number of commentators didn't give him much hope but he proved them wrong. I think Trek do a model called the 'Soho' which is belt driven and aimed at the commuter market. I presume the belt drive eliminates any risk of arriving at work with oily chain marks on your legs. Patrick, you're probably right about it being the future of bike design (altho the enclosed oil bath chain cases that have been around for donkey's years seem to offer similar advantages) but I'm sticking firmly with tradition. I'm astonished that you remember the make of my sleeping bag Kern, 😀 Dennis wouldn't have a clue! However, Mountain Equipment is a British based firm (altho its probably all made in China now rather than Stalybridge) and not connected with Mountain Equipment Co Op. 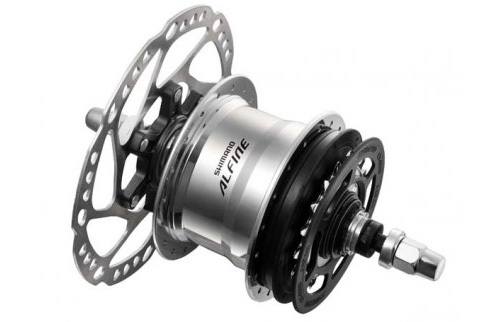 Shimano Alfine 11-speed hub for belt-drive and disc brake... nice (tempting, but as Kern pointed out: my bike frame requires a special break ... to change fit the belt).